The launch of the NASA/NOAA NPP satellite seems to have gone off without a hitch this morning which is great news. This satellite has instruments that are vital to continuing data streams that were pioneered on the aging TERRA (1999), AQUA (2002) and AURA (2004), satellites – including the CERES instrument for monitoring the Earth’s radiation budget, a microwave sounder to continue the AMSU data and a visible/IR camera to complement the work of MODIS. We really need to apologise for the acronym soup though – it is an endemic disease in satellite discussions. Indeed, NPP is a recursive acronym, standing for NPOESS Preparatory Project, where NPOESS stands for the National Polar-Orbiting Operational Environmental Satellite System. The patterns are not particularly surprising, there is higher salinity in the sub-tropical evaporative regions, lower salinity near the equator (because of the rain! ), and particularly low salinity near big river outflows (the Amazon plume stands out clearly). However, as we noted earlier, the main interest is going to be in the variability. Results from the NPP mission will take a while to come out and be cross-calibrated with the existing records, but given other recent disappointments (GLORY and OCO), this is a huge boost to the effort to monitor the Earth System. different subject: this morning’s launch of NPP appears to have gone off without a hitch. after the back-to-back failures of OCO and Glory, I for one am very encouraged to see NASA (and NOAA) make a successful launch of a new Earth-observing satellite. This is good news, but does it also carry instrumentation to measure methane releases? This is a big concern right now in the Arctic, definitely something that needs monitoring. That is not a recursive acronym! An acronym is “recursive” if it contains a reference to itself, as in GNU, which stands for “GNU’s Not Unix”. Look at http://npp.gsfc.nasa.gov/spacecraft_inst.html for a list sensors on board. Methane does not appear to be of interest but you can never tell when someone will figure out a way to use a sensor in a manner not originally intended! That’s the fun of remote sensing. I am surprised to see that NPP is not net primary production (of photosynthesis) here. wili, though observation of methane fluxes by satellites seems impossible, methane concentration is observed by GOSAT and the results are shown at http://data.gosat.nies.go.jp/ . I did work both on the CRIS instrument and GOSAT (much more on CRIS). Once data of NPP assimilated be prepare to see a significant improvement in the weather prediction. The amount of new information gathered by these new instrument is staggering. That can’t be right. Think about it. Look up the listed sensors. Check the previous research results from earlier satellites. A minute or two with Google Scholar can’t hurt. There’s nothing labeled “Methane Sensor” — but ask yourself, how does a satellite detect methane? Not by sniffing. Papers you’ll find in Scholar go into how they work on turning photons into data sets and comparing ground measurements with satellite measurements taken at the same time. Fascinating stuff. Yeah, there is interest in this. I am also glad the launch was successful. NASA’s choices of launch vehicles from Mercury to today leaves a lot to be desired. Does anyone possess a complete list of active sensors and what they measure for all non-military satellites worldwide? How many of those sensors are operating beyond their rated lifetimes? Not to worry about second order acronyms. I once got hassled by a secretary over a 3 deep acronym. All spelled out, it took up 3 typewritten lines, so the secretary gave up. 6 Kooiti Masuda: I don’t know how to use the GOSAT web site. Nor do I have a password. I see that there are Operation manuals, which suggests that the web site is not something you just read like RC is. So is there a GOSAT web site for the rest of us? It is also a disease in environmental law (EPA, CAA, CERCLA, NRDA etc, etc.) One of my professors in law school joked that in a cubicle in one of the office buildings in Washington DC is a worker whose entire job is coming up with acronyms for the federal government. Thanks for the interesting update on the satellite launches and results. Aquarius seems like a particular fascinating piece of technology. In newspaper reporting anything not obvious is taboo. CIA, FBI and not much else, really even if introduced in the lede. It is what it is. Sounds like a standard graphical method of displaying second order and higher order acronyms is needed. The sites http://www.gosat.nies.go.jp and http://www.jaxa.jp/projects/sat/gosat/index_e.html have introductory documents, though they do not have substantial numerical data. The sites http://www.gosat.nies.go.jp and http://www.jaxa.jp/projects/sat/gosat/index_e.html have some introductory documents, but they do not have substantial numerical data. a quick look at the site mentioned by Kooiti Masuda suggests its primary purpose is data distribution (i.e., “This web site provides processed products of GOSAT observation data”). for a more general intro to GOSAT, try this link: http://www.gosat.nies.go.jp/index_e.html. They’re straining at GNATS (garish name acquisition techniques). From an old Reader’s Digest joke. Indeed, we’re well into the era of second-order acronyms. When two science initiatives with acronyms that doubtless were fun to think up in the first place, the Study of Environmental Arctic Change (SEARCH) and Developing Arctic Modeling and Observing Capabilities for Long-term Environmental Studies (DAMOCLES) sought to cooperate, the obvious name for their bridge was “SEARCH for DAMOCLES.” Hence, the fine second-order acronym … S4D. I’m not making this up but admire those who did. My Kingdom for an acronym…. I remember being interviewed for a job where understanding of climate models was a topic of interest. When asked “what does RCM stand for?”, I quickly answered “radiative-convective model”. They commented “um, OK, we’ll accept that, too”. I later realized they were probably thinking of “regional climate model”. I also remember a colleague who was doing some coding for something he called the “Gulf Islands Regional Land Simulator”. This was being done back in FORTRAN 66/77 days, with it’s limit of 6-character variable names. As was the proper habit, the code was to be used as a subroutine, leading to numerous instances of the phrase “CALL GIRLS” in the main program. Oh, and glad to hear about the successful launch! Thanks all and sundry for insights and links. This is RC at its best! How did I reach that conclusion? Simple, I read what the sensors are capable of. The algorithm theoretical basis documents for the various sensors can be here: http://jointmission.gsfc.nasa.gov/science/documents.html. I admit I have not read through them all but you are welcome to do so and report back about methane detection. Look forward to hearing about it. This site is about the launch of a joint German/French sensors specifically designed to detect methane…neat stuff.. I have no experience with ESA data so you are on your own. Good hunting. GOSAT gives point source origin information for methane. Other satellites have given total column measurements. Continuity was discussed some time back as available from the CrIS instrument. Satellites derive methane from infrared data — multispectral instruments from which data could be extracted to develop the information. There’s no methane detector per se. Going into the details about the various satellite programs and the need to continue taking data as the older satellites go out of operation, it’s — well, not something to be proud of. Over and over the reports describe program cuts, instrument cuts, and gaps in the data as a result. How are you going to know what’s happening if you can’t do the science? Nunn and McCurdy? Congressmen, 1983. Some of the capability of the NPOESS satellite set is military; military funds were restricted starting in 1983. > measure for all non-military satellites worldwide? I don’t know, but there’s a lot of information in the Earth Observation Handbook. Re. #3, better than “second order acronym” would be “Russian Doll acronym”, IMO. Re #30 Yes, I agree. RDA covers all levels, whereas SOA quickly requires TOA (confusing in this context), then FOA, FOA, SOA, SOA, etc. Agreed the more humid it is (due to rain and moisture in the air) the lower salinity it becomes. 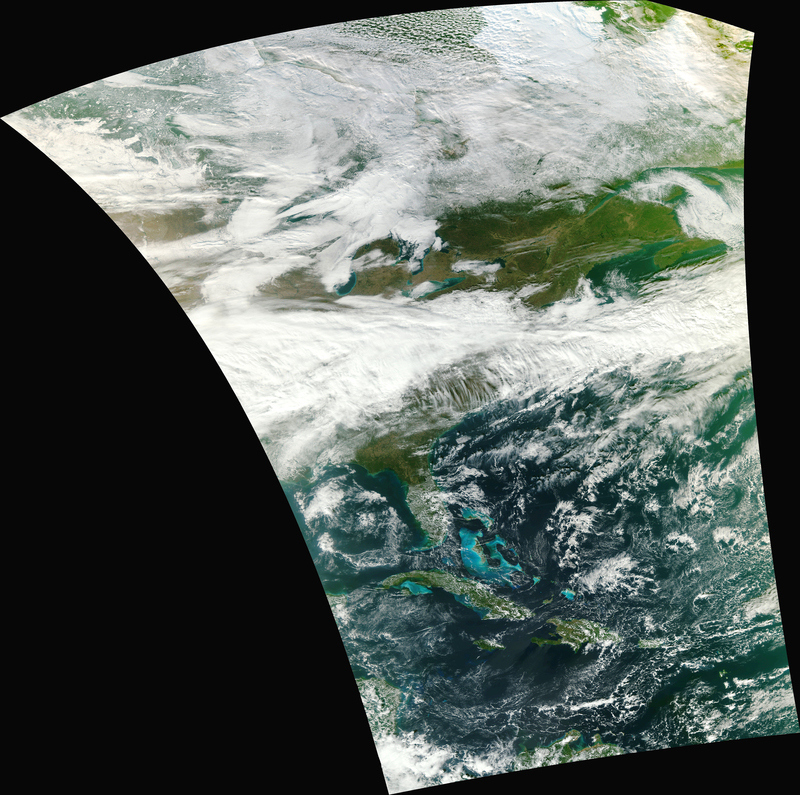 This high-resolution image is of a broad swath of Eastern North America from Canada’s Hudson Bay past Florida to the northern coast of Venezuela. The VIIRS data were processed at the NOAA Satellite Operations Facility (NSOF) in Suitland, Md. “This image is a next step forward in the success of VIIRS and the NPP mission,” said James Gleason, NPP project scientist at NASA’s Goddard Space Flight Center, Greenbelt, Md. VIIRS will collect radiometric imagery in visible and infrared wavelengths of the Earth’s land, atmosphere, and oceans. By far the largest instrument onboard NPP, VIIRS weighs about 556 pounds (252 kilograms). Its data, collected from 22 channels across the electromagnetic spectrum, will be used to observe the Earth’s surface including fires, ice, ocean color, vegetation, clouds, and land and sea surface temperatures. “VIIRS heralds a brightening future for continuing these essential measurements of our environment and climate,” said Diane Wickland, NPP program scientist at NASA headquarters in Washington. She adds that all of NPP’s five instruments will be up and running by mid-December and NPP will begin 2012 by sending down complete data. NPP serves as a bridge mission from NASA’s Earth Observing System (EOS) of satellites to the next-generation Joint Polar Satellite System (JPSS), a National Oceanic and Atmospheric Administration (NOAA) program that will also collect weather and climate data. NASA Goddard manages the NPP mission for the Earth Science Division of the Science Mission Directorate at NASA Headquarters in Washington. The JPSS program provides the NPP ground system and NOAA provides operational support. During NPP’s five-year life, the mission will extend more than 30 key long-term datasets that include measurements of the atmosphere, land and oceans. NASA has been tracking many of these properties for decades. 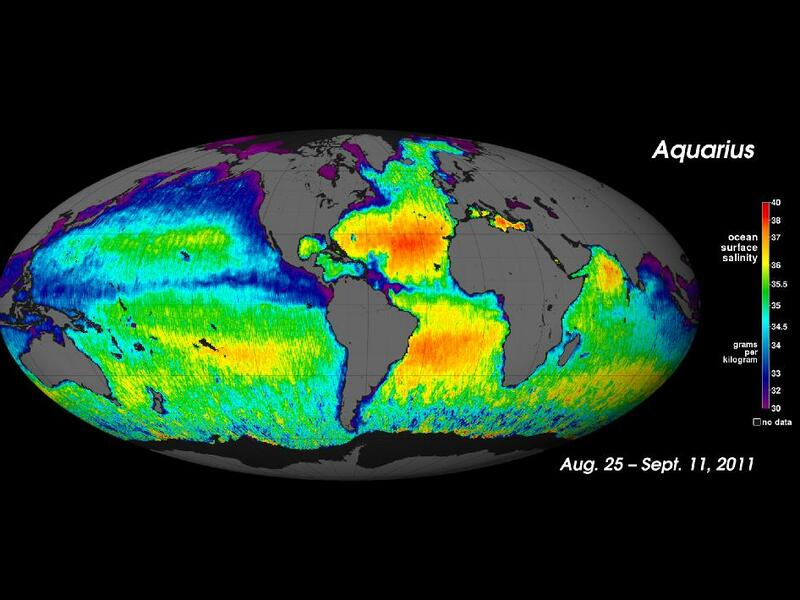 NPP will continue measurements of land surface vegetation, sea surface temperature, and atmospheric ozone that began more than 25 years ago. “The task now for the science community is to evaluate VIIRS performance and determine the accuracy of its data products,” said Chris Justice, a professor of geography at the University of Maryland, College Park, who will be using VIIRS data in his research.